Dennis and I had a quiet but very thankful Thanksgiving. I decided the day after Thanksgiving should be homemade noodle day since I wasn't up to Black Friday Shopping. I used semolina and all-purpose flour with eggs and olive oil. I think this was the best egg pasta I have made to date. Some of it was rolled into egg noodles, some into lasagne noodles and some into fettichinni. We ate turkey noodle bake for lunch and broccoli lasagne with the addition of sausage for supper. Yummy!!!! I won't have to cook for a few days. We are so thankful for our family and friends. Sending you our lovc. On a recent trip we stopped at the Lodge Cast Iron store. I learned a very useful tip and tried it out. It worked great. The tip: spray perch pan with oil and then preheat it in the oven while you mix up the cornbread. The cornbread batter should sizzle when you pour it in the perch pan. When baked the little perch cornbreads come right out. Spray, heat, and pour again. My challenge quilt has returned home. I received an e-mail asking if a photograph of the quilt could be included in a Math Teachers' magazine. I gave my consent. My husband had gone shopping at a big box grocery store, so we spent the morning processing food. Now a big pot of chili sets simmering on the stove. Yummy! My husband loves a good garage sale. He recently bought a massage table that had hardly been used. No one enjoyed it more than our grandaughter! We spent Halloween day with my sister and her family. The sun was shining and the sky was a beautiful October blue. Yes, there was even a nip in the air. She had decorated the center of their circle drive with pumpkins and gourds that they had grown. We had a pumpkin carving contest. My son carved the pumpkin that is spilling it's guts. The excess pumpkins went to feed some chickens. My sister was told that pumpkins are a natural wormer for chickens. You learn something new everyday! We have a new addition to our family. Our grandaughter wasn't so sure about Lulu at first. She was afraid she would be scratched, but soon found she had nothing to fear. Lulu's dinner consists of animal crackers that you have to eat for her. Lulu could not make the trip to Germany so is living with us at the lake. Another piece of fabric has caught my fancy. Not sure where this one will lead. I really like the graphics and can see them used as applique designs and/or embroidery designs . . .
Kaffee Fasset will be at TN Quilts tomorrow afternoon to sign books. Yes, I will be in line. Then he will lecture Friday evening. Yes, I will be at the lecture with pen and pad. Saturday and Sunday he will be teaching classes at TN Quilts. No, I didn't sign up for classes in time and there is a long waiting list. But, I will be working and may hear a tip or two. I made my placemat pattern out of fabric he designed. My pattern and his fabrics are available to purchase online from www.tennesseequilts.com. Fall has come to Boone Lake. I took this picture from our deck last Monday. It has been raining ever since then. Our blueberry bushes and holly bushes are showing new growth with all this moisture. For several years (I've lost count) female relatives have gathered at our home to attend Quiltfest in Jonesborough, TN in July. The gathering has evolved and grown to a house full of sewing machines and laughter and lots of quilting. About five years ago we started doing a family quilt challenge. This year is to be a mystery quilt. One person knows the end result and e-mails, monthly or so, directions to the others. We were given a fabric shopping list before we parted ways last July. 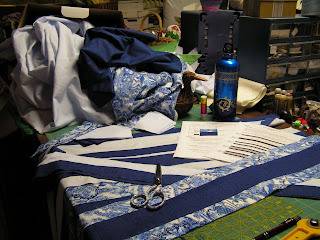 The above picture shows my three fabrics and the result of the first cutting and sewing instructions. It is now packed away until the next instructions arrive. We will show our finished quilt tops at the Friday night Quiltfest banquet. It is fun to see different quilts during show and tell time there. I have received a request for the Rhubarb Crunch recipe. Cut in 1 cup butter and sprinkle over rhubarb. I just recently read, If you are out of brown sugar, make your own by adding 1 - 2 T molasses to 1 cup sugar. It works great!